How do 21st-century evangelicals carry out the Great Commission biblically but also effectively in a world full of cultural diversity? Does the Bible provide any principles for communicating and contextualizing the Gospel of Jesus Christ to particular demographics, people groups, and nations? 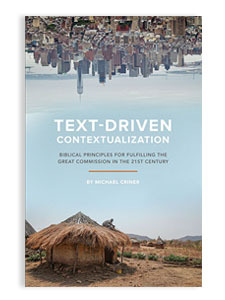 In Text-Driven Contextualization, Michael Criner argues that the Bible does, indeed, provide instruction for how to contextualize—and how not to contextualize—the Gospel in preaching and evangelism. A thorough examination of five sermons in the book of Acts (two delivered by Peter and three by Paul) reveals principles by which pastors and teachers can biblically contextualize their sermons for the 21st century with evangelistic fervor. Michael Criner serves as senior pastor of the First Baptist Church of Bellville, Texas. He earned both his Master of Divinity (with a concentration in biblical languages) and Doctor of Ministry (in Christian worldview and cultural engagement) from Southwestern Baptist Theological Seminary. He also has a Bachelor of Arts in Practical Theology from Howard Payne University. He and his wife, Abigail, have three children.